The old way marketing a business was storytelling. However, in today’s world, communicating your brand’s story in the hope that customers will listen is no longer enough. Instead, your authentic brand must be evident in every action the organization undertakes. Today’s most successful businesses are storydoers. In True Story, creative executive Ty Montague argues that any business, regardless of size or industry, can embrace the principles of storydoing. Why do we choose the clothes we wear, buy the cars we buy, choose the friends we hang out with or our jobs? According to strategy consultant Ty Montague, everything we do, every action we take is part of our metastory. A metastory is different from a traditional story because it is not told; it is done. "Storydoing," in Montague's terms, is creating your true story through your actions. A business will have a metastory as well, and in his book True Story, Montague explains how businesses can use the concept of the metastory to define or create their brands and strategies. The truth about the participants. This is the truth about the people who are affected by what the business does. They can include customers, employees, suppliers, shareholders and even society at large. For example, a retailer called Stylebox (a fictional name) filled its stores with a huge number of unbranded generic products. When the company developed the metastory of its typical customer - a mother with a household income of $40,000 a year who was working hard because she aspired to better things for her family - it realized, Montague writes, that the unattractive generic products mainly emphasized to customers that they couldn't afford the real thing. Stylebox developed a more positive relationship with its customers, reconfiguring its generic offering with a visible and attractive brand name and more selective products. The truth about the protagonist. This is the key truth of the business itself. Montague describes how, to develop its strategy and its brand, the new digital-driven education division of News Corporation had to understand its core truth as a protagonist: It was an optimistic new player in education that was outside the traditional educational battle lines of status quo unions and crusading reformers battling those unions. Amplify, as the division was branded, is an advocate for a "third way" toward its vision of an education system with happy teachers, happy parents and happy students. The truth about the stage. This is the truth about the context in which the business operates. Spike TV, for example, was based on the traditional he-man identity and featured scantily clad women, car crashes and wrestling. This stereotype was outdated in a world in which women drove big trucks and watched Ice Road Truckers (on another channel), and many men took the stay-at-home role in the family. The truth about the stage had completely changed from the past, and it was up to Spike TV to change with it. The truth about the quest. This is the truth about the overall purpose — beyond making a buck — of the company. The Shaklee Corporation stagnated after its founder, a pioneer of the nutritional supplement industry, had died. The company came back to life when it modernized its quest to use technology to help people take the first steps to health and keep them on the path. No one truth is the linchpin on which a strategy or brand metastory is built. In the examples above, one truth is highlighted, but all four truths were involved in paving the way for change and success. 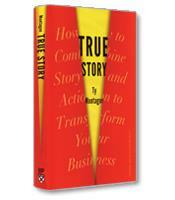 True Story offers a concise yet innovative framework for identifying the defining elements of your business and for using this to build the metastory that will capture the attention and loyalty of your customers.